Kimberley Cruise | Australian Adventure Cruises: Broome & The Kimberley Holidays: NEW Kimberley Cruising package offer! Broome & The Kimberley Holidays: NEW Kimberley Cruising package offer! Broome & The Kimberley Holidays have partnered with Kimberley Quest II and are pleased to present an exclusive NEW package offer. Kimberley Quest II is taking 30% off all remaining "Southern Quest Fly/Cruise" itineraries for the 2011 season. That's a saving of up to $4490 per couple. But wait, there's more..
· 7 nights 'Southern Quest Cruise/Fly' Broome to Mitchell falls or v.v onboard the Kimberley Quest II. · Return airfares from most major capital cities. 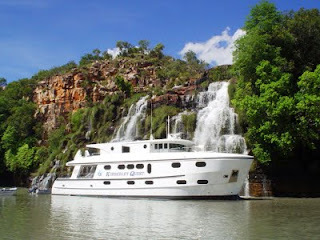 Pearl Sea Coastal Cruises, Kimberley Quest II, is a luxury small vessel specializing in wilderness expeditions along the vast coastline of the Kimberley between Broome and Wyndham for just 18 passengers. As a small vessel operator they specialise in small groups, providing comfortable surroundings and intimate experiences that will be remembered forever. The Kimberley Quest II has been designed for relaxing and exploring the Kimberley coastline in comfort and style. Carrying three excursion tenders, days are filled with a myriad of activities, exploring the waterways with your very own local guide who has extensive knowledge of the Kimberley region. There is a choice of 9 cabins from deluxe twin, double, superior and the exclusive flybridge. All cabins feature private ensuites, individual air-conditioning, viewing windows, mini-refrigerators and are serviced daily. · Package is valid on all 7 Day Southern Quest cruises for the remaining 2011 season only (July – September). · Prices start from $6642* ex Perth, $6922* ex Melbourne & Brisbane, and $6882* ex Sydney.